The emergence of my favorite plants from their winter slumber, and catching the scent of damp earth, make my green thumb awaken from its winter rest. I feel like I understand how it feels for the sap to start rising in the trees, as my energy level starts to rise and my mind brims with my mental to-do list. It’s time to gather my gear for another gardening season! Recently, I was reminiscing about the Sears catalog “wish book” from my childhood. That led to me thinking that the Baker Creek Heirloom Seed catalog is kind of my “wish book” now. It’s more than just a catalog, its entertainment and education. It makes me excited about the new growing season and what new adventure it might hold as I read about new plants and varieties. Like a kid, I fold over pages and circle things, and make a long list of everything I want. After I’ve made my wish list, I get out my seed stash and take inventory. My list of favorites gradually grows each year as I find the plants that grow reliably well for me and that we enjoy most. I want to be sure that I have plenty of those on hand, so I note the ones I need to reorder. Then I decide which new things I’ll try this year and place my order. My favorite source of work clothing is Duluth Trading. I’ve been wearing their shirts for years, and they’re the first things I reach for on my work days at home. They’re made of good-quality cotton, thicker than usual, and they also make them longer so that I don’t have to worry about gawking gophers while I’m working. (You’d have to be familiar with their silly commercials to get that, LOL!) They’re made for working, so they have room for movement, unlike your typical t-shirt. They have other thoughtful details, too. For example, their tanks have little straps to keep your bra straps from sliding down. Or some of their shirts have a “Shirttail Shammy,” especially for cleaning your glasses. Some have special pockets for your phone or notebook. My Duluth shirts are well-worn, so I just ordered a few new ones. They have a wide range of other gear for gardeners, too. Shoes, hats, gloves, overalls – you name it, really. I just ordered one of their gaiters to try this year. You wear it around your neck to keep you cooler, and it helps keep the sun off, too. Three items of gardening gear: CobraHead weeder, gloves, and a well-worn Duluth shirt. My favorite tools are my pruners, snips, trowel, and the new CobraHead weeder I won in a giveaway that Angie the Freckled Rose had. I’d been wanting one, so I was especially excited to win it! My first use of it was to work on pulling up some grass that had formed a patch in my front yard. I was delighted at how it made that task so much easier! I’m sure I’ll have lots more fun with it as the season progresses. 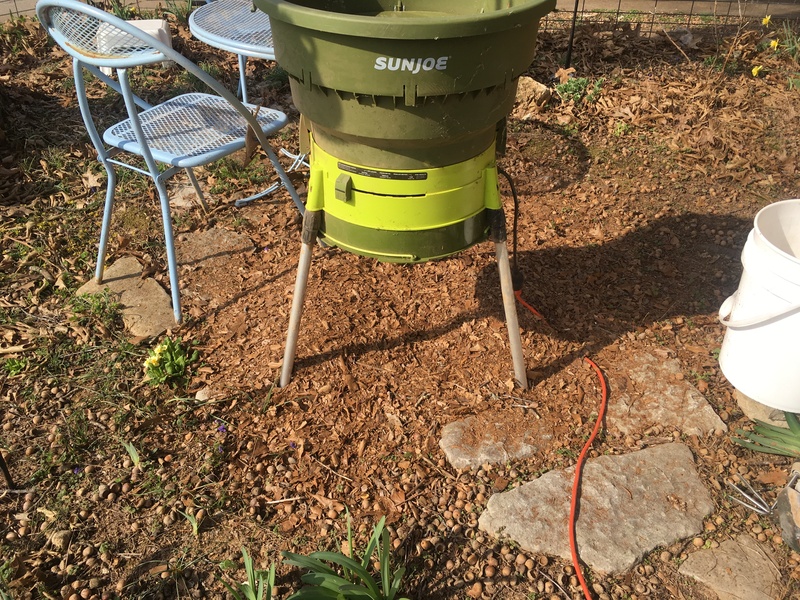 I just ordered replacement shredder line for my SunJoe Leaf Shredder. 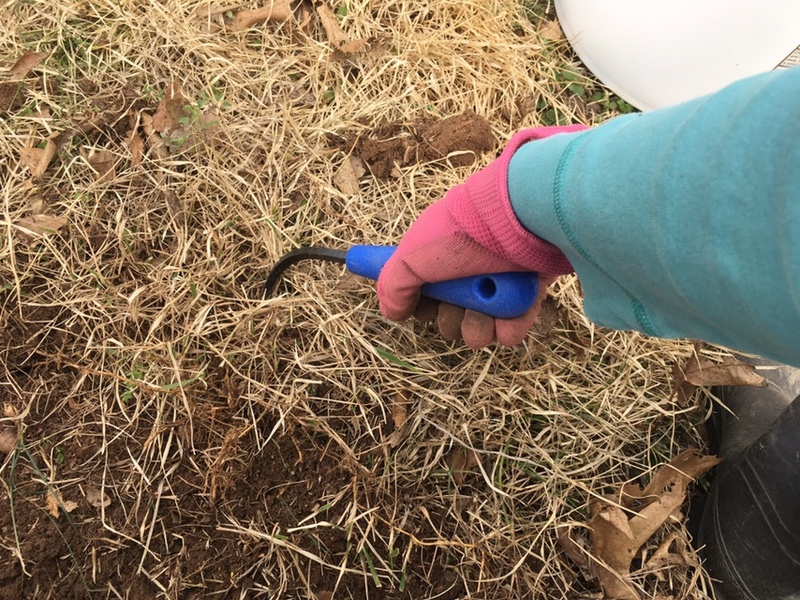 I wrote about it last year and I just got it out to use in cleaning up my front yard as I wrote about in “Clearing the Way for Spring.” It’s a lot of fun to use! Now I feel like I have all the tools that I need on-hand. Being out in the sun can take a toll on your skin. As I get older, I’m becoming even more aware and want to do what I can to protect it. I have a few different hats that I wear to help keep the sun off of my face and neck. Lately, I’ve preferred a colorful one that I can wash, but straw hats are nice, too. In addition to the hat and gaiter, I’m still going to need to take care of my skin. Being an organic gardener, my concern for chemicals doesn’t stop at the garden, it applies to myself as well. I discovered some all-natural skincare products from LimeLight by Alcone. I’m happy that they don’t contain any chemicals, and they even use organic ingredients as much as possible. I was so impressed with the products that I signed up with the company as an Independent Beauty Guide! Now I’m stocked with moisturizers and boosters that help repair sun damage, as well as a good scrub for restoring my hands after they’ve been working in the dirt. I really don’t like using sunscreen because of the chemicals in it, so I’m especially excited about the all-natural sunscreen they’ll be coming out with soon! I’m armed and ready to not only enjoy the warm weather, but take the best care of my skin possible. Now that spring has returned, I feel well-rested from my winter break and ready to get back out there and dig, plant, weed, prune, and harvest. Having my garden gear stocked helps to make it easier as well as safer. Happy spring, everyone! I’m starting to get really anxious for warmer weather and time in the garden! My first seeds sprouted yesterday, and I have Irises starting to show their green leaves! I’m always hesitating to spend a lot of money on my clothing, but bit by bit, I’ve been adding quality stuff to my wardrobe. I’ve got insulated Carhartt pants, good gloves from them, and the best pair of long underwear I’ve ever owned. I replaced my winter jacket with something far more appropriate this winter, and I either wear Bogs or Muck boots all year round around our homestead. I keep thinking that I should just take the plunge and buy some good shirts, but I haven’t yet. Maybe I’ll be doing that soon! I’ve long considered buying from Duluth, but always hesitate because of the cost, even though I know it’s a good investment…. I’ll probably be discussing this with my husband soon! Duluth has good sales, so I try to take advantage of them. I wear Muck boots in the winter, but they’re too hot beyond that. I do have some garden boots I wear until it gets hotter and then I’ll wear something cooler. Thanks for sharing! The right gear helps, doesn’t it?! Thanks for all these helpful tips, Michelle. Sun protection – that’s something I often forget. 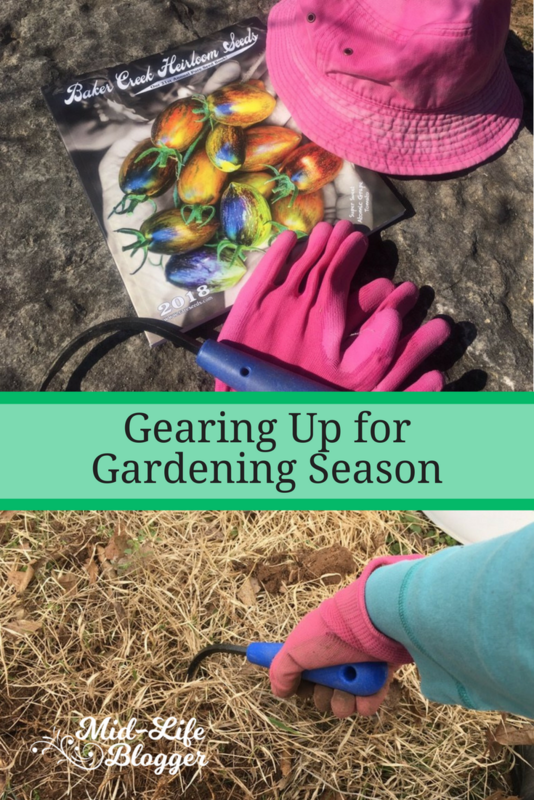 Sometimes I forget the sun protection, too, but I’m becoming more mindful of the downside of gardening – the sun damage, and that’s helping me pay more attention to that part of my gardening gear. Sunscreen is something I often forget and I have your same concerns about it. I wear a floppy hat too, and work in the garden in the morning before it gets hot and the sun gets too strong. I loved reading about your gardening gear; our tools are important and the better the quality the longer they’ll last and the easier they’ll make our job. When it gets hot, I’ll get out earlier. But this time of year I wait until it warms up. I’m a fair-weather gardener, LOL. Some sunscreens contain chemicals, and some burn my eyes if I sweat and they get in them, so that’s why I often skip it. I’m hoping the all-natural sunscreen will work well, and can’t wait to try it!